The blooming period was approximately a month. White flowers with 3 petals whose tips are purple and edged. The purple color at the tips of petals diffuses asthe days go, and all petals turn pink at the end of the blooming period. 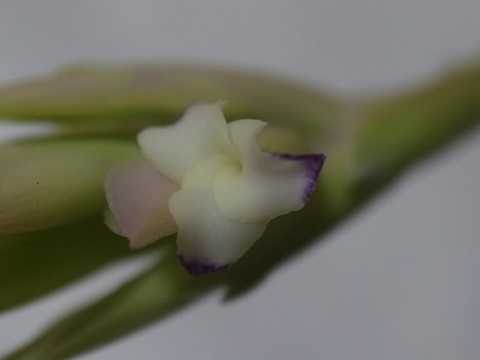 6 stamens and a white pistil are not visible. A flower blooms for 3 - 5 days. 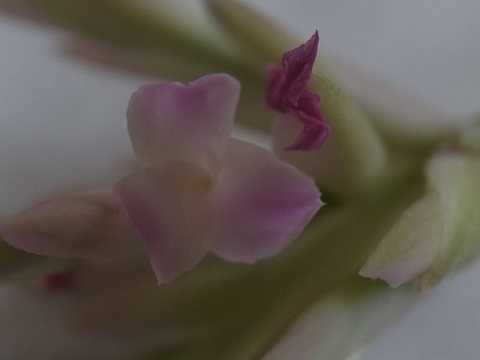 Approximately 4 - 7 flowers bloom from the bottom side of the branch of the inflorescence at intervals of 4 - 7 days. The branch at the top of the inflorescence blooms first. Other branches begin to bloom approximately 12th day of the blooming period from the bottom side of the inflorescence at intervals of a day. The flower of the 3th day of the blooming period. The purple spot at the tips of petals begins to diffuse. The flower of the 4th day of the blooming period. The petals turned pink.